The Charlottesville Mural Project recently announced that VCUArts alums Emily Herr and Eleanor Doughty will curate its latest mural as the project ramps up its efforts to bring top-tier muralists to the city. Selected by a panel of Albemarle High School students, local residents, and arts advocates, the pair began work on the retaining walls at Barracks Road June 5 and plan to finish the mural by June 9. Barracks Road is a designated Albemarle County entrance corridor and connects one of the city’s busiest shopping centers to rural Albemarle County. According to a press release from the Bridge Progressive Arts Initiative, this mural project is a partnership between The Charlottesville Mural Project, The Bridge Progressive Arts Initiative, Albemarle High School, The County of Albemarle, the Virginia Department of Transportation, and local residents. Herr and Doughty will work together on the design and execution of the mural, which will cover both the Georgetown Road and the Hydraulic Road retaining walls at Barracks Road. The two artists met in their freshman year at VCUarts and were roommates for several years. 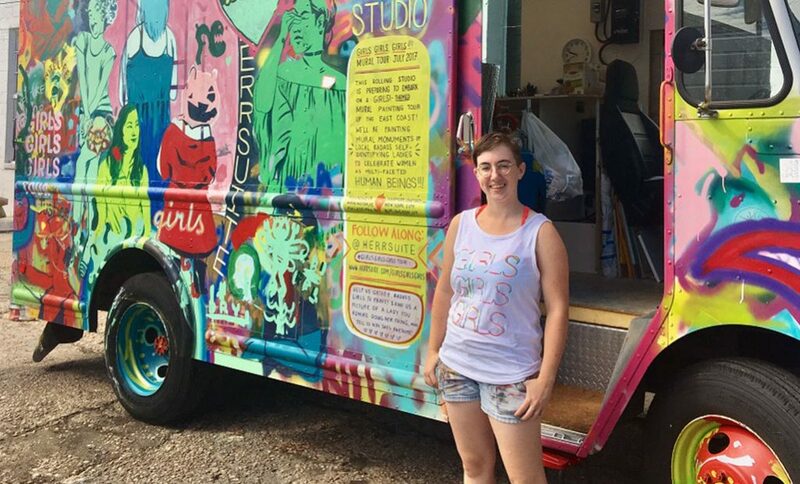 Doughty graduated with a BFA in illustration from Virginia Commonwealth University in 2013 and her work has been featured in publications such as Graphite Magazine, VICE, and the Boston Globe, and Herr, a Richmond native, and fellow VCUarts graduate, has been creating murals locally and abroad under the name HerrSuite for the past 10 years. 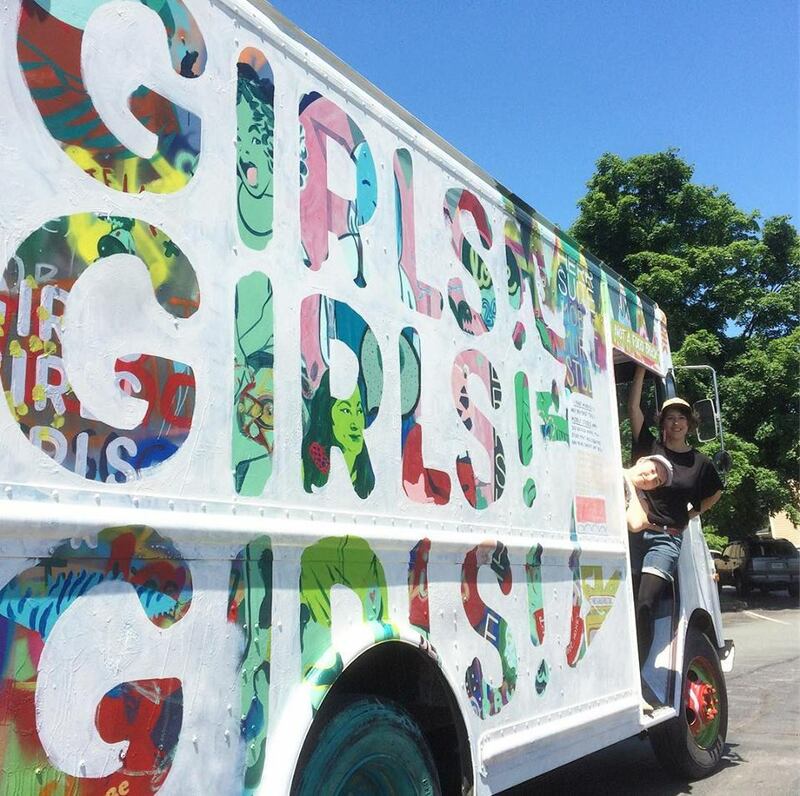 Her latest project, a traveling mural project called “Girls! Girls! Girls!”, challenges stereotypical depictions of women in public art. The Charlottesville Mural Project and has been steadily increasing its commitment to public art in the city over the last year. The most recent piece was curated by Detroit muralist Kyle Danley in the Belmont neighborhood of Charlottesville and celebrates the working class history of the Belmont community, and was completed last weekend. In September 2017 Chicho Lorenzo, a muralist from Madrid, Spain, was selected to create a mural on a massive retaining wall at Barracks Road and features his vibrant illustrations inspired by Spanish art and culture. The Charlottesville Mural Project was the subject of some controversy last Autumn after a mural was proposed that would engage the terrorist attack that took place in Charlottesville on August 12, 2017. The mural was gifted to the city by world-famous artist Shepard Fairey, but its construction was ultimately put on hold after being heavily criticized by community members who said that the mural did not adequately address the complicated narrative of the events that transpired on August 12, or represent the communities to whom the attack was directed.